I’ve been spending alot of time in my garbage can lately. Never before has it been such a delight to retieve stuff I thought was worthless, even the things stuck to the bottom of the can. I feed them into the uscomic.8bf machine and out comes instant Strange Tales and Journey into Mystery 1960’s vintage comic book imagery. Of course it’s not art or anything like that. Are comic books literature? In keeping with my cheap, economical ways, I’ve been using a program called XnView. It’s just one of those free image viewers that allows you to browse directories of images by creating a bunch of thumbnails. It also had a few “effects” with it. Nothing special, just versions of common things like oil painting and the shakey shifty smudgy ones. 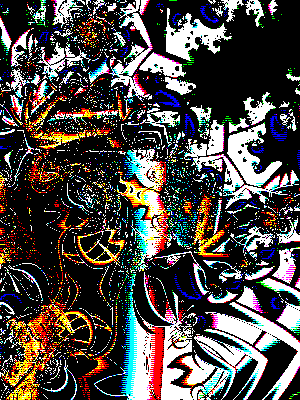 Also a funky dithering thing that makes images look like they’re full of cross hatching and dots like they used to use in the old days to fake colors that were too expensive to print separately. A really bad inkjet printer does the same thing. It looks great. Anyhow, XnView has this menu option that says “Adobe Photoshop Plugin.” Now that sounds professional and stuffed with money to me. But no, you can get them for free too. So among three or four hundred other plugins I downloaded one evening, was this uscomic.8bf. Filters or plugins or whatever, are either very cool or absolutely stupid. I got about 398 stupid ones and two cool ones. The other one produces a black and white (2 color) pen and ink image. The comic filter fixes up lousy color too. Or rather it makes it look like an old comic book; which might not always be what you want. Of course, the real excitement comes when you start to combine filters and develop sequences or “algorithms” that, more often than not, produce good effects. 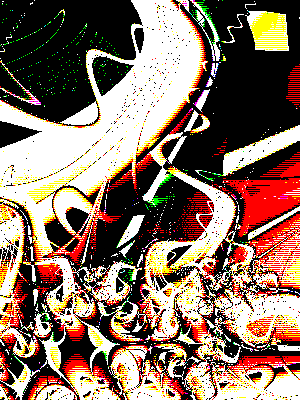 For instance, inverting the output of uscomic looks pretty interesting sometimes. It looks silkscreened and rather artsy; not comic bookish at all. But I guess that’s what you’d expect the opposite of a comic book to be. As a somewhat humorous postscript, I accidently discovered the underlying simplicity to much of the uscomic filter. I clicked on the adjust “brightness/contrast/gamma/balance” tool to prepare my raw image for the filter and saw the image go comic book all on it’s own. It seems the last settings for the tool (which it automatically restored when I went to use it again) were +77 for brightness (range is -127 to +127) and +127 for contrast. This produces almost exactly the same results as the uscomic filter –even the color reduction to 8 colors. Bright images will need to be inverted to complete the effect. The graphics program is like a guitar. Look at all incredible music that can be made with a guitar. And it’s only got six strings. “What can this strange device be? — Rush:2112:I’m not giving anymore clues in the hope you listen to whole gol’darned thang. Why? I remember a time when we all rushed out to become web MASTERS — nobody gave so much as a hoot an’ a holler about then thare web WEAVERS. In those days Content(emphasis on the 1st syllable) was more often than not confused with content (emphasis on the 2nd). What I like in these works of Tim is the idea of a space created between the viewer and the surface of the image (and the surface of the screen, I should say pondering on my condition at the computer now). For me the “between” is when/where the image “takes place”. Saying it more datailed, is when the image “opens” its internal space where there is a layered, unexploited and secret depth. This is very impelling: seeing to his works means to be invited for a permanent movment, when the eye runs deliberately at both inside/outside of the limits of the image. So, is an activing space! Space where the notion of a not deterministic “time” also takes the initiative of guiding our visual exploitation. Time!!?? Yes! Time because his works are initially encountered as an “entity” whose parts and internal relations would only gradually reveal themselves to the viewer. To reinforce his idea of “active space”, Tim takes advantage of saturated and brilliant colors suddenly interrupted by large areas of pure black or by areas of “scrapped” pure whites, wich produces a compeling multiple spread of bright-radiant-colorful light. This “pontuaction” creates a rhythm on his ever shifting, unstable and luminous works. Following the meanings of such a “unquiet” space, the viewer’s eye goes around in multiple directions and along divergent axes, as if an enigma would have been given to be unclouded. Such “pleasure of sight” remains as dominant for the perception of Tim´s disembodied-colorful-mutating light with luminous effects interspersed with strong blacks and whites. If we try to define them in a word, I would call the works shown here like ”multifocals”, in the sense of a loss of certainties for the eye. But this is also very meaningful in the senses of what we understand how modern art is (where someday fractals are going t o be included), when meanings could no be fixed, the beliefs dissappeared and forms became uncertain.